Posted on March 22, 2017 April 24, 2019 , in Hot Tubs. Once you have your hot tub installed, you will be excited about putting it to use. Once it’s up and running, it’s worth taking the time to book professional servicing to ensure that it’s well maintained for years to come! If you live close enough to a professional hot tub service provider, you can take advantage of the many different types of service packages that are available. Ideally, when purchasing this type of unit, find out the distance that the company will travel to provide maintenance service. Maintenance requirements will depend on the hot tub you have and how often it is used. 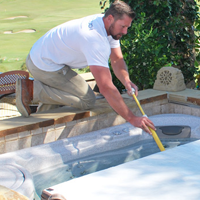 One of the priorities of regular servicing is ensuring that the hot tub is cleaned properly. This includes cleaning of the filter, strainer baskets, spa shell and floor, as well as the water line. By keeping these items clean, the water will remain stable. You also want to ensure that your spa water is cleaned and sanitized before it is properly balanced with the right chemicals. At times, the water will need to be shocked and then followed with a water clarifier, which allows the water to be sparkling clean. During servicing, the professionals will also check and adjust the jets as necessary, as well as take preventative actions to ensure that the hot tub is properly filtered. While it may seem like a big task, it comes easy for the pros because they do it all the time. They will also advise you on how often your hot tub should be serviced. You may soon discover that regular maintenance is something that you can easily do yourself, and all of the required chemicals are easily purchased. However, there will be times where extended care is required, and this may be something you would want the hot tub service providers to handle. Extended care typically includes full draining of the hot tub, including its hoses and pipes, as well as flushing the pipes with a commercial cleaner and checking all major components of the system. Many packages even include cleaning of the hot tub cover and accessories to ensure that the hot tub looks great! Once a year, you may want to give some serious thought to calling in the hot tub service experts to give your unit a top to bottom cleaning and inspection. This servicing focuses on the inspection of the pumps, lighting, filtration systems, and a review of how the jets are functioning. During this once a year servicing, each and every hydro jet should be removed and cleaned, including their housings. Once the unit is refilled with the water, it should be treated and balanced. These are typically the highlights of a yearly hot tub cleaning and inspection. You will have peace of mind knowing that your hot tub is in peak condition! Now that you’ve found out about planning for the professional servicing of your hot tub, download our buyer’s guide and view our variety of hot tubs.